Crowne Plaza Phuket Panwa Beach is one of the newest Phuket resorts to open and offers a unique location overlooking Makham Bay. 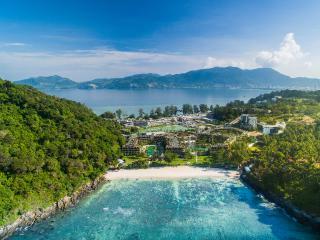 The Phuket International Airport is a 50 minute drive away while Phuket town, Patong Beach and other tourist attractions can be easily accessed from the luxury 5 star resort. This Phuket accommodation is fronted by a 200 metre private beach and is perfect for those who enjoy relaxing and taking a break from a busy lifestyle. The rooms and suites at Crowne Plaza Phuket Panwa Beach have been designed to cater for couples and families featuring modern amenities and private balconies overlooking either the gardens or Makham Bay. The Panwa Duplex Lagoon Suite is ideal for those who like to keep to themselves and have their own space as it set over two levels and features a private swimming pool. There are a variety of outstanding facilities at Crowne Plaza Phuket Panwa Beach including 2 beachfront swimming pools, a 24 hour gym, day spa, kid's club, WiFi internet, restaurants and bars plus a water sports activities centre. The wide variety of facilities at this Phuket accommodation will ensure both couples and families will feel right at home. 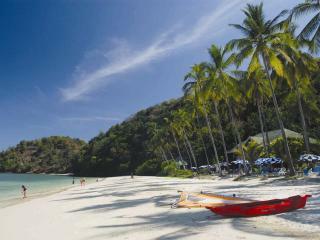 For your next Phuket holiday with families or as a couple why not treat yourself to this stunning Cape Panwa Resort. Crowne Plaza Phuket Panwa Beach boasts 226 well-appointed rooms and suites all offering modern amenities. Andaman Sea View Room: Features a private furnished balcony with views overlooking Makham Bay. Room size is 42m². Bedding is 1 King Bed OR 2 Queen Beds. Maximum room capacity is 3 Adults OR 2 Adults & 2 Children. 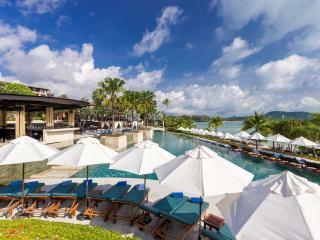 Grand Andaman Sea View: Features a private furnished balcony with views overlooking Makham Bay. Room size is 70m². Bedding is 1 King Bed. Maximum room capacity is 3 Adults & Children. Grand Andaman Sea View Terrace: Features views over the ocean and a bath with bay window overlooking the sea. Room size is 100m². Bedding is 1 King Bed. Maximum room capacity is 3 Adults & Children. Panwa Duplex Lagoon Suite: A 2 storey suite featuring an indulgent bedroom with a view of the sea, walk-in wardrobe and couple spa bath in the loft. There is a private living area and dining nook on the lower level. There is also a terrace that leads directly out to a semi-private lap pool. Room size is 100m². Bedding is 1 King Bed. Maximum room capacity is 3 Adults & Children. Mosaic: Features all day dining and offers a wide selection of authentic Thai and Pan Asian dishes with indoor and alfresco dining areas. Open daily from 6.30am - 11.00pm. Patio al Fresco: Dine al fresco and beachside. Open daily from 11.00am - 11.00pm. Biscuit Cafe: Start your day with a cup of premium coffee and excellent pastry! The bakery café also showcases a list of gourmet sandwiches and burgers, and delectable sweets. Open daily from 7.00am - 9.00pm. Lobby Lounge: Relax on the sofas and enjoy afternoon tea, snacks, or a perfectly mixed cocktail. Open daily from 9.00am - 12.00pm. Splash Pool Bar: Recline on the sun lounger by the Splash Pool while sipping on a glass of refreshing tropical beverage from Splash Pool Bar. Offering a broad selection of refreshments, the laid-back bar also serves delicious barbecue lunch of grilled juicy seafood and succulent meats. Open daily from 11.00am - 5.30pm. Pawan Panwa Spa: Enjoy a variety of treatments and massages, walk away feeling relaxed and rejuvenated. Beachside massages can also be arranged. Open daily from 10.00am - 8.00pm. Kids Club: The supervised kids club is the perfect place for kids to make new friends and learn about the Thai culture.